Most adults are not aware of Life Long Learning (LLL). Our target audience is the large number of adults who have left school early or who have never had the opportunity to receive formal education (as in the case of many migrants, refugees, Travellers, marginalised people, and people with disabilities) and are "seniors or ageing population". Opportunities for Life Long Learning and especially for European Synergy should be facilitated. The core idea of the project is to teach adults critical analysis thus improving their quality of life and their life styles. 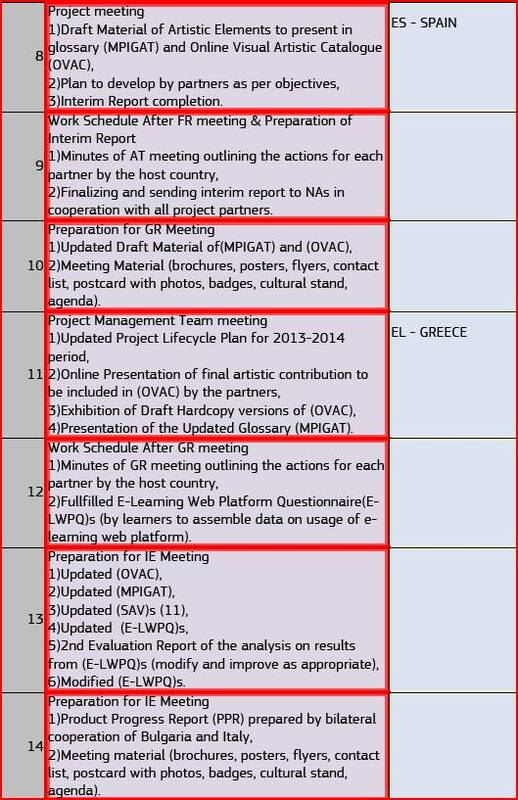 All resources available to the project partners will be considered throughout the project in order to facilitate learning for the target group (TG). This step will be in conjunction with teaching spoken English so that adults can improve their self confidence. Cultural sensitivity of the TG will ensure a greater connection to the national citizenship platform through a European (E) multi dimensional platform. 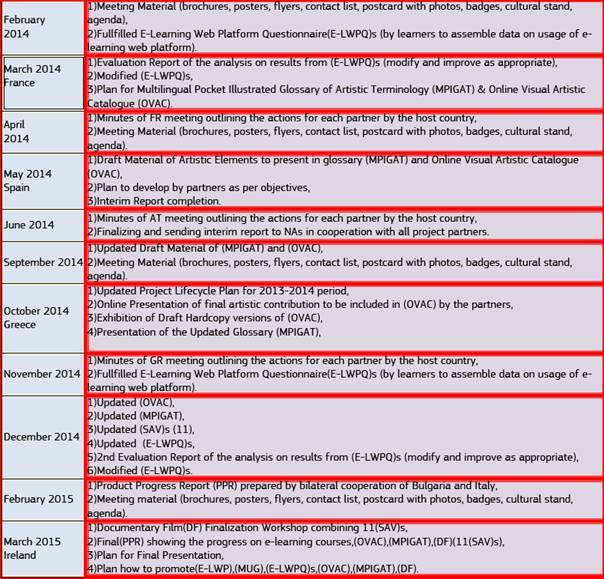 Finalizing the project it is expected to exhibit all the project outcomes [such as E-Learning Web Platform (E-LWP), Multilingual Users Guide (MUG), (E-LWP) Questionnaires, Online Visual Artistic Catalogue (OVAC), Multilingual Pocket Illustrated Glossary of Artistic Terminology (IMPIGAT), Documentary Film (DF) (consisting of 11 different Short Audio-Video (SAV)s) created by the adults) at a conference hall of a prison, in order to include the disadvantaged adults in prisons through LLL.. This way the project's final outcome will portray an increase in European consciousness achieved through a unique E Synergy. As a result the number of the adults who will present our catch phrase "N2L84ES!" will be detected as one of the performance criteria of our project. 12)To use the advantage of cooperation with volunteers (if possible). The objective of our project is to use a creative, pedagogical and didactic approach to learning which will incorporate the use of ICT with art, drama, music and language. Each partner is skilled in these areas to enable easy access and learning for the target group. Strengthening participants self-confidence and promoting their personal fulfilment will be gained by helping them to develop social, civic and cultural competencies. The development of social media tools will enable participating countries to effectively communicate with each other by uploading blogs, photos, work logs etc. This will enhance the learning experience as well as further fulfilling our goal of ES.This is further developed by each TG actively participating in all aspects of the project from brainstorming to presenting the final products. A project-symbolic poem presentation by one of the French representatives of the E-Seniors Association, Paris (FR) at the 2nd Transnational Partner's Meeting in Maltepe, Istanbul (TR) of the Grundtvig Partnership Project, "Never Too Late For European Synergy" (N2L84ES), within the framework of the European Union's Lifelong Learning Program. For further information, please consult the official project website: http://sarges1966.wix.com/n3l8es. The poem recitation is based upon the following lines from "Morituri Salutamus: Poem for the Fiftieth Anniversary of the Class of 1825 in Bowdoin College"
Till the tired heart shall cease to palpitate. To men grown old, or who are growing old? The scenario of the 4(SAV)s will be created among“haiku style of teaching English,short rhymes,short artistic piece of art/drama/creative writing/music,English-teaching with ICT-karaoke/-scrabble,local sounds,background music and project-symbolic poem recitation by the adult learners&staff enhancing Fun&Learn activities"
15)Distrubution of Tasks Schedule for the (FRW) in TR? 17)Renewal of (PNAF) along with (PA) TBA? 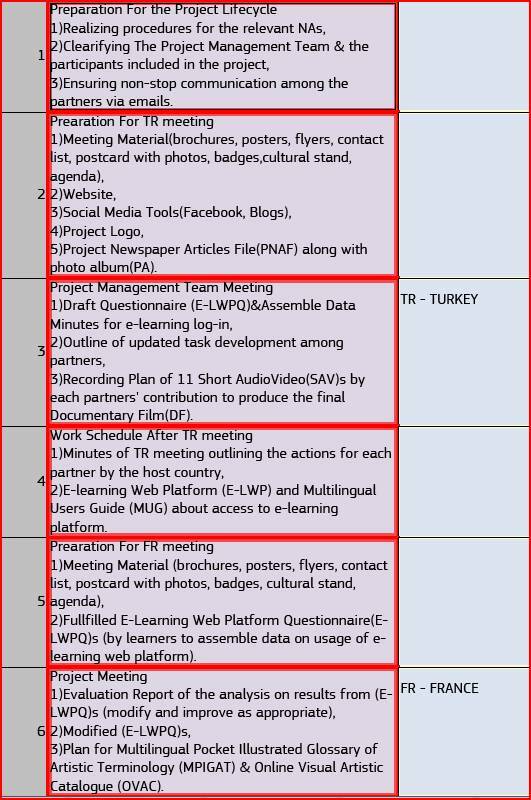 You know we (as representatives of Turkey, Ireland, France and Italy) are now making workshops in order to fullfill our application form.And we would be very happy if u can be online with skype or msn so that we can finalize the details our proposed project. Timing for online connection is between 15:00 and 16:00 (Turkey timing) today (11.01.2012). Yalı M. Rıhtım Cad. No:27 Maltepe/ İSTANBUL"
-Taking active role while evaluating the project meetings and annual workshops via minutes, midterm, final and other promised reports as stated in part "D.4.Results and Outcomes"
12)Involvement of the innovative pedagogical and management issues of the project through the regular running adult education curricula of the partner institutions. 1st step:The host organisation will assemble minutes and actions to be performed by partners before each meeting. This will ensure even distribution of tasks and that they are completed within a certain timeframe. -Feedback through Facebook, blogs and website on project products. -Evaluation of the performance of the products (such as (E-LWP),(MUG),(E-LWPQ)s,(OVAC),(MPIGAT),(DF) (consisting of 11 (SAV)s) will showcase the work produced as the products record of the work over two years). -Evaluation of the potential development of project products (may be used by future learners and teachers to facilitate lifelong learning for a Transfer of Innovation (TOI) project). 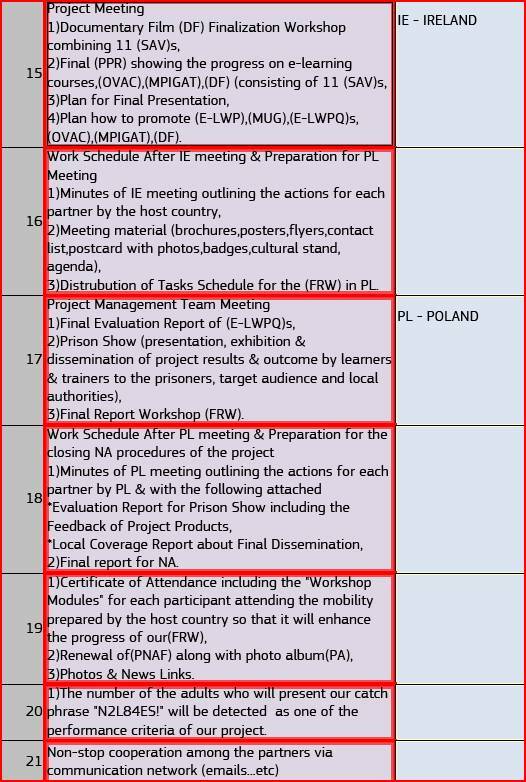 -Evaluation report observing the feedbacks of N2L84ES products from the target pilot prisoners in Poland as a future guide for all European instutions volunteering to work with adults in prison throughout the potential future Grundtvig partnership project proposals (the number of the adults who will present our catch phrase "N2L84ES!" will be detected as one of the performance criteria of our project). f)Developing an online European network among the Project News Links directing each one to other links. As a result dissemination and usage of the results, experiences and, where applicable, products of the partnership wil have been realized in the participating organisations, in the local communities and in the wider lifelong learning community.